Anna has been playing tchoukball for around ten years having started in 2008 after her best friend Max Ciperle invited her to a tchoukball camp in Lignano – she immediately fell in love with the sport and how it’s a sport based around "fair play, family and passion". 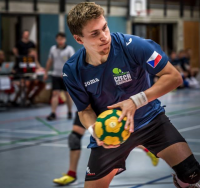 Our second player from the Czech club of Limeta Lomnice and Popelkou is right-handed player, Dominik Šimůnek. His tchoukball foundations were built at Limeta eight seasons ago in 2011 and he’s remained with the club ever since. He’s previously played beach tchoukball but decided to take it more seriously after he gave up athletics.